Forrester recently released the latest version of their social technographics report, a ladder-shaped classification of online social behavior. The original report, released over two years ago, included six categories (ignoring inactives, those who did not participate in social media). 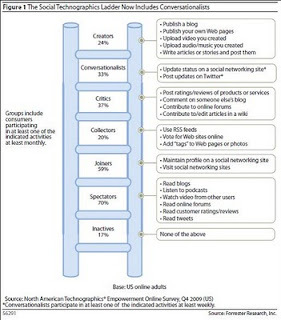 At the bottom of the ladder, spectators observed social media (blogs, reviews, etc.) without participating, and at the top, critics wrote reviews and creators blogged and uploaded video. But a crucial category was missing: active participants of social networks. That category was newly dubbed "conversationalists" in the latest version of the Forrester report. 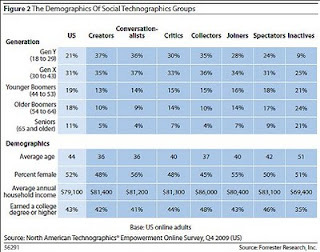 Conversationalists are 56% women- the highest female concentration amongst the social technographics groups.They have an average household income of over $80,000, and over 40% are college educated. Although conversationalists have the highest concentration of women of all the categories, women make up 55% of joiners, and most of the other categories hover around 50%.